Coconut Grove is South Florida’s original bohemian enclave. Known to early settlers as Little Hunting Ground, it was pioneered in 1825 and later became a destination for northern travelers and the workers who served them. 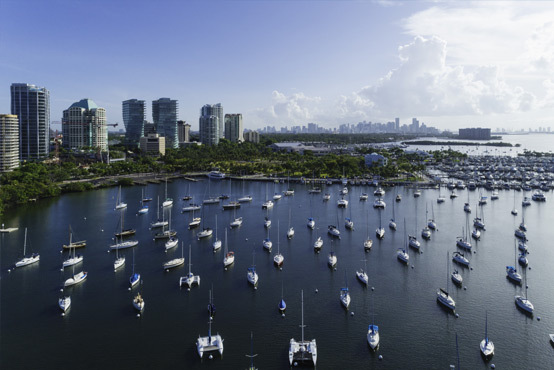 Perched between Biscayne Bay and U.S. 1, today Coconut Grove is cited as the “oldest, continuously-inhabited neighborhood in Miami.” Some have used “laid back” to describe this eclectic village on the fringe of metropolis. Locals know “the Grove” as a funky a throw-back to the 1960s. Homes help define this Avant-garde locale. Along Biscayne Bay are multimillion dollar estates with spectacular, waterfront views. Off the water, nestled among the hammocks and lush foliage are uniquely remarkable homes that jibe perfectly with the Grove’s unusual style. The Grove’s top planned or gated communities include The Moorings, The Gables Club, Four Way Lodge, the private Camp Biscayne, Cloisters, Bayshore Villas and L’Hermitage. Luxury condominiums include Grove at Grand Bay, Grovenor House, Grove Hill Tower and Ritz Carlton Residences along south Bayshore Drive overlooking Sailboat Bay. The arts are at home in the Grove. The retail sector, anchored by CocoWalk, is dotted by boutique shops and art galleries. Outdoor festivals, events and fairs include the internationally known Coconut Grove Arts Festival, the King Mango Strut – a perennial parody of the former Orange Bowl Parade, The Great Taste of the Grove Food & Wine Festival, and the Goombay Festival, which celebrates Bahamian and Caribbean culture. Still home to writers and musicians, the Grove lures executives who live here work in Coral Gables or downtown Miami. Both are a short drive along U.S. 1 or a convenient ride on the MetroRail. They return to leave the bustle behind and hustle to a uniquely bohemian beat. To learn more about Coconut Grove, Coral Gables, South Miami, Pinecrest, Palmetto Bay, Brickell, or Key Biscayne contact Val Byrne with EWM Realty International or www.MiamiRealEstateWorks.com at email at [email protected] or by phone at 305-323-6231. Val Byrne – Working For You!